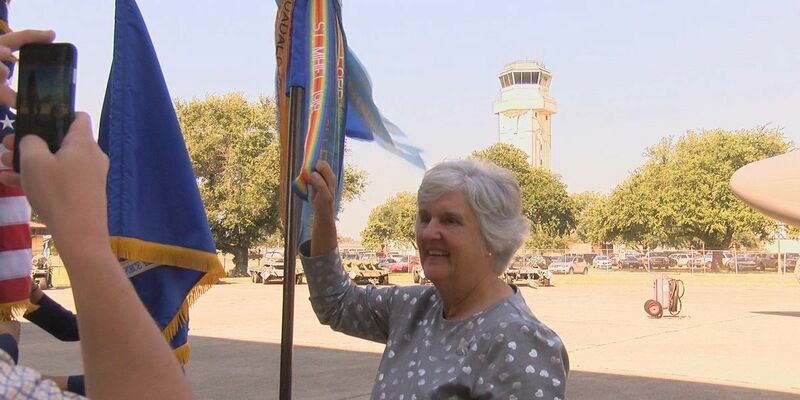 BARKSDALE AFB, LA (KSLA) -The daughter of WWI flying ace U.S. Army Air Corps Capt. Charles d’Olive, 93rd Pursuit Squadron, is set to fly onboard a B-52 Stratofortress. Susan d’Olive Mozena will set flight with an aircrew from the 93rd Bomb Squadron on September 21, 2018 to honor the 100th Anniversary of World War I. Her father, former Lieutenant d’Olive, was a member of the first class of American pilots trained to fly the French SPAD S.XIII fighter during World War I. He achieved the first aerial kill in the squadron’s history when he shot down a German Fokker D.VII fighter on Sept. 12, 1918. He would go on to shoot down a total of five Fokker’s from Sept. 12-19, 1918, eventually earning him the title of Flying Ace. Mozena has been an avid supporter of the 93 BS and the 307th Bomb Wing. She and her entire family have participated in numerous military events to memorialize Captain d’Olive’s accomplishments and commemorate World War I. She has also loaned various military items of her father’s that are of great significance to the 93rd’s aerial history. These items are on display for Airmen to reflect upon the unit’s distinguished history and d’Olive’s service. Last August, KSLA News 12’s Marie Waxel interviewed Mrs. Mozena at the unit’s centennial celebration. Click here for that story.